to a musical programme by the Indian school. Spent the remainder of the day in the Transportation building. When we come out of there it was dark and rainy. We followed back the way we came to the 57th St entrance and got our supper outside the grounds. went home on cable cars. Wednesday October 4th 1893 George went with us to the city this morning and we went down on the lake. We spent all the forenoon in the manufactories building. After lunch went into Agriculture hall and from there to Forestry building, looked through the Krupp display of guns, saw the fleet of Columbus and some big pumps at work. Eat out suppers of corn cakes on the grounds and stayed fir fireworks. Came home on the elevated road tonight. We met Dr Clapp, Mr & Mrs Maggard, and Uncle Jim Stevens today. the weather was very pleasant today. 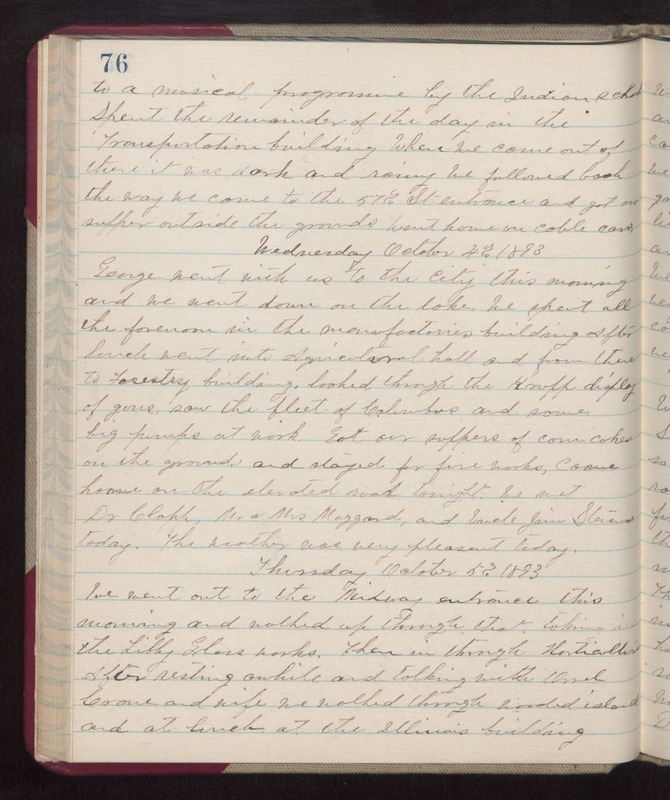 Thursday October 5th 1893 We went out to the Midway entrance this morning and walked up through that taking in the Libby Glass works. Then in through Horticulture. After resting awhile and talking with Orvel Crane and wife we walked through wooded island and at lunch at the Illinois building.